How do I request a new Custom Data Source? Learn how to start the process of importing dimensions and metrics into Funnel from a Data Source that is not already supported. There is some way to access the data. For example via a scheduled email report, a file on a FTP server, via a reporting interface etc. Of course, there are always exceptions to the rules, but these two principles help us determine if an integration is feasible. The best way for us to look into the platform you want us to connect to is if you add it as a new connection in Funnel. Navigate to the Data Sources page and click the + Data Sources button. Scroll down to the bottom of the list of connected advertising accounts and choose Custom data source. You will be presented with a form to fill out. We ask these things of you to work with you to setup your Custom data source. 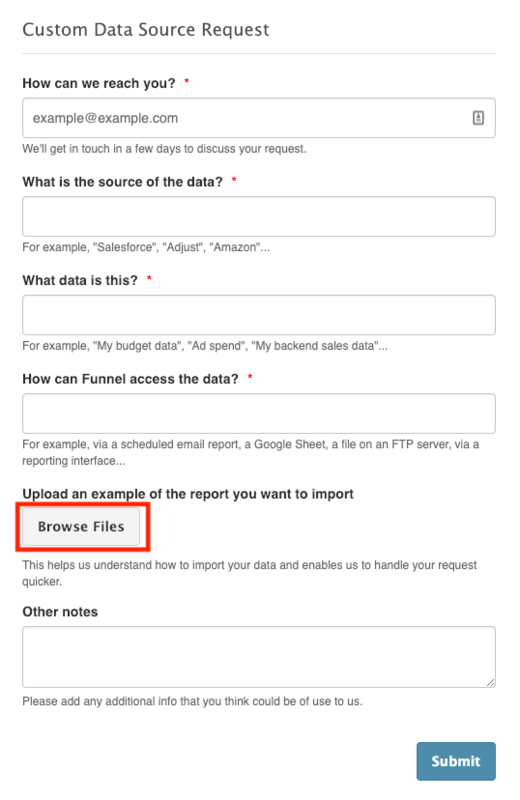 Fill out the required fields and upload an example file of the data you wish to import into Funnel. Click Submit. Next, we will take a look at your request and investigate whether it's possible to connect to Funnel or not. We will reach out to you to start a conversation and work from there.